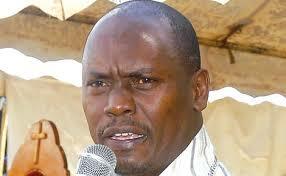 Kiambu Governor William Kabogo has accused cord leader Raila Odinga of having a low thinking capacity due to his uncircumcised nature. He said that Raila and his cord team have nothing important to do but spend all their time talking about Uhuru Kenyatta instead of focusing o other important matters that will help them progress. According to Blogger Robert Alai, governor Kibogo was trying to change the subject and deviate the attention of everyone after he was asked by Kiambu MCAs to address how he used Ksh 50million allocated for equipping the hospital. #GovernorKabogo is being asked by Kiambu MCAs how he used Ksh 50million allocated for equipping the hospital but instead of addressing that, he starts calling the name of Raila. Kwani Raila alikula bibi ya Kabogo bila condom? He is calling Raila uncircumcised person, and that those who are not circumcised have low thinking capacity, he says he has money he can defend himself in court. Circumcise your brain Kabogo. Don't threaten Raila if you have failed to perform in Kiambu.